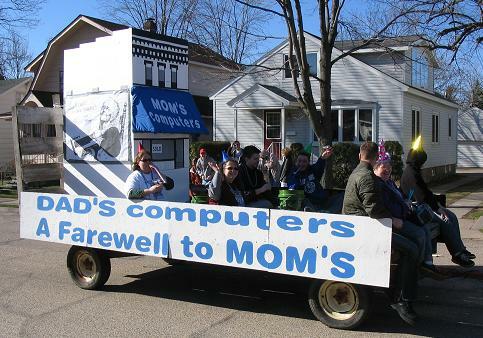 This year we didn't have a trailer to ride on so Dad build this sweet float and put it on top of his car and drove it in the parade! 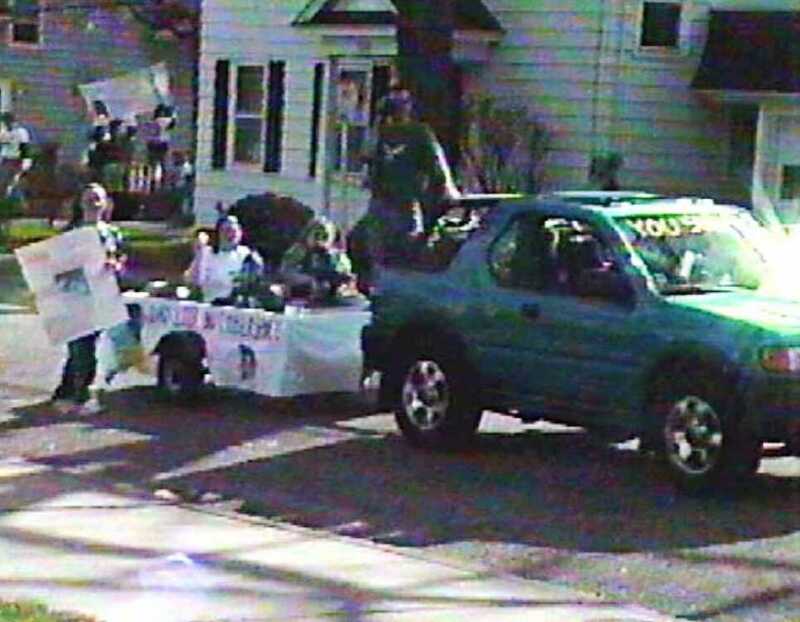 Bonus: Here is another photo of Dad driving our float around in the parade! 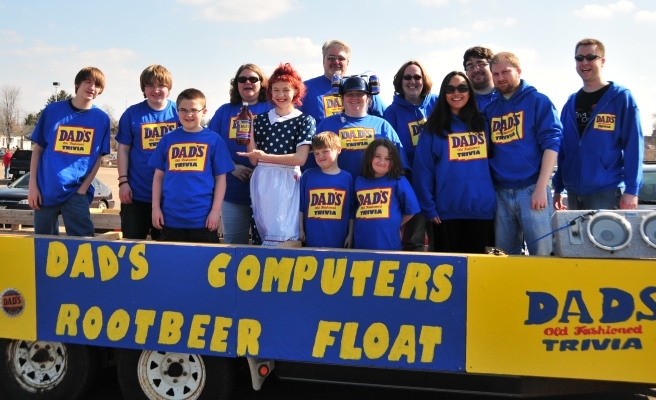 This year our theme was just "Dad's Computers" We made up Dad's Rootbeer sytle shirts so we decide to have a Rootbeer Float in the parade. We threw official Dad's Rootbeer Rootbeer Barrels! 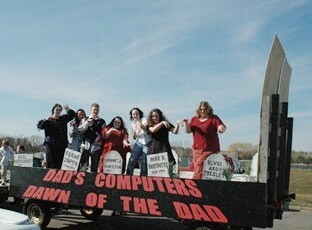 This year our theme was "Dad's Computers: Pretty in Pink Floyd" as an tribute to John Hughes who recently died & the official trivia Star Wars theme. We all dressed like Star Wars characters but also being Pink. 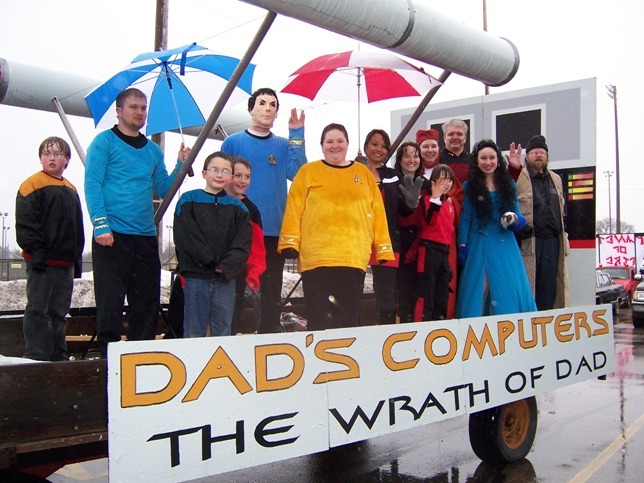 We also made a giant pink Jabba the Hut. 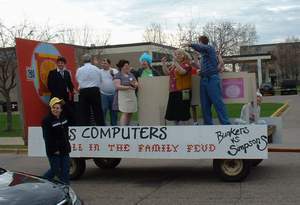 This year our theme was "Dad's Computers: Trivia is the word" This theme was about an episode of Family Guy where Peter listens and sings to "the Bird is the Word" during the whole episode. 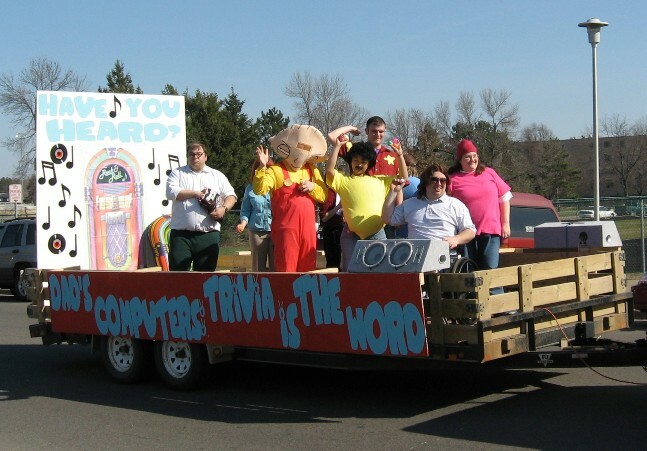 We all dressed like Family Guy characters and played "The Bird is the Word". 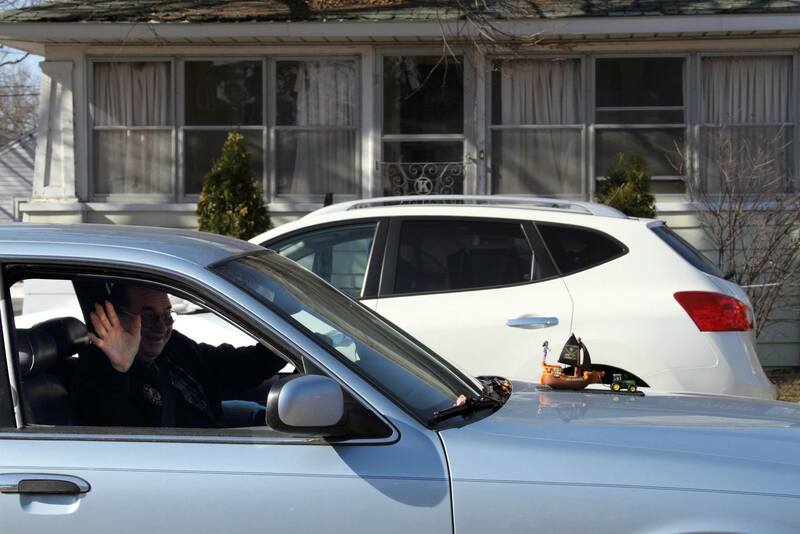 We also threw eggs filled with candy! 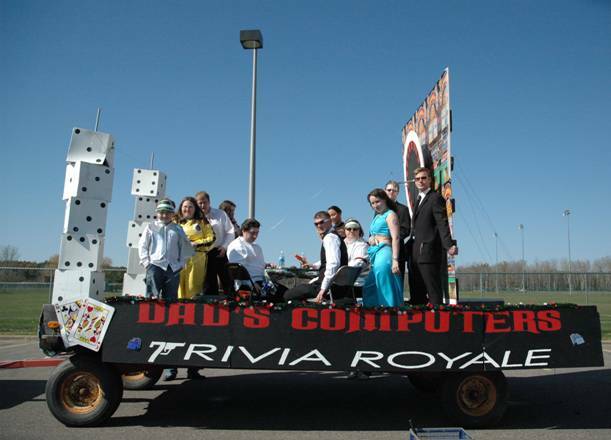 This year we decided to go with "Dad's Computers: Trivia Royale" for our theme so we had a casino float. The backboard had a giant roulette wheel that spins on a wall of slot machines. Everyone dressed up like characters from Bond movies and we even through poker chips with our theme on them. 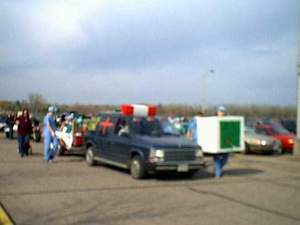 The float looked great even though on the way to the parade the backboard came flying off and we had to do a quick repair once we got in line. 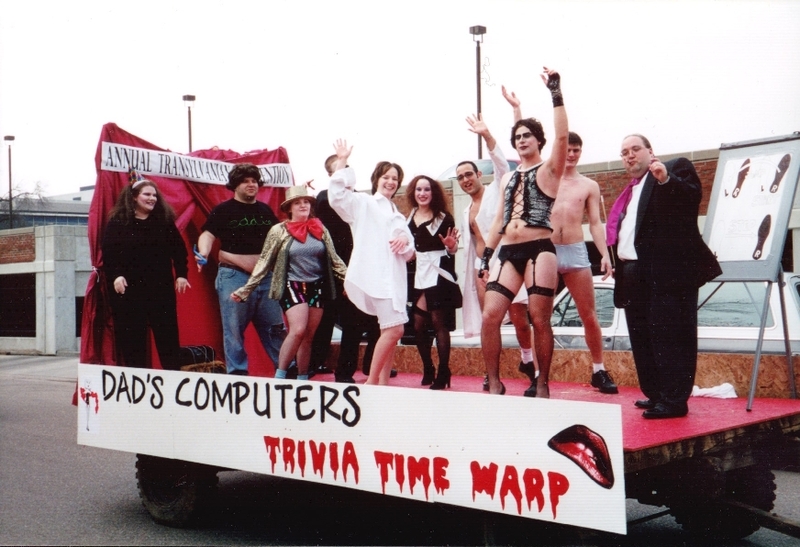 The trivia theme this year was "Thanks for the Contest" in honor of Bob Hope. 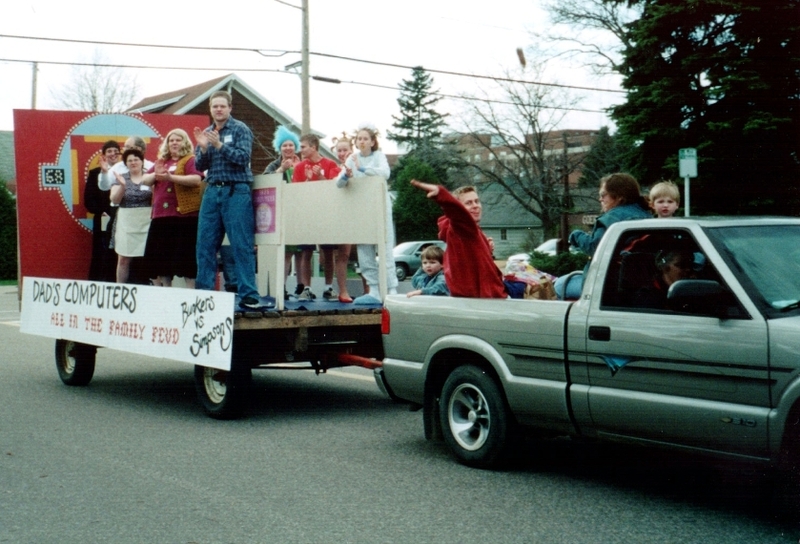 Bob hope always did USO shows so for our parade we had a big military vehicle and all dressed up in army gear and played the song "Boogie Woogie Bugle Boy"